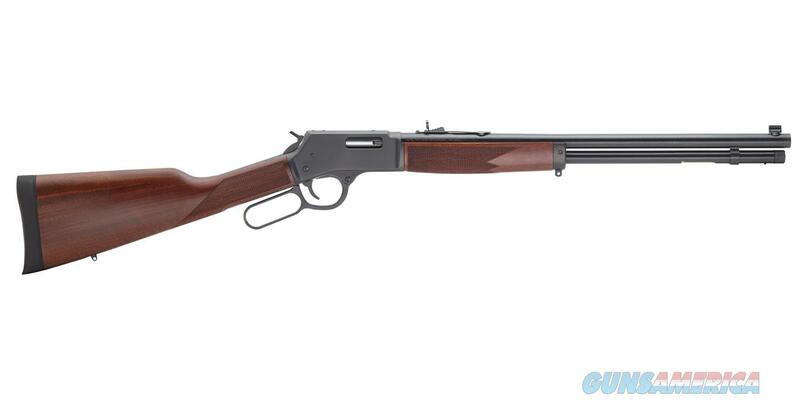 Description: Henry R.A. Big Boy, Steel Frame, .327 Federal, 10 round capacity. While we are fond of the brass tradition begun by B.T. Henry’s 1860 rifle, we do understand that today’s hunter may prefer something a shade lighter on the mountain, and the 2015 introduction of the Big Boy Steel carries on the same brush gun appeal of the brass-framed Big Boys in its overall configuration, but with upgraded features for the modern hunter, while weighing in 1.68lbs. less than its cousin. The 7lbs. steel Big Boy hangs its 20? round barrel and checkered walnut furniture on a matte-finished blued steel frame that’s drilled & tapped for optional scope mounts, and uses the same adjustable Western-style sights as the standard Big Boy, with the same sliding transfer bar “safety” system in its hammer. Most of the weight savings is due to the steel frame being lighter than a brass counterpart to begin with, and less steel in the thinner barrel walls than an octagon version.